This new journal may be of interest to Stair Society Members. 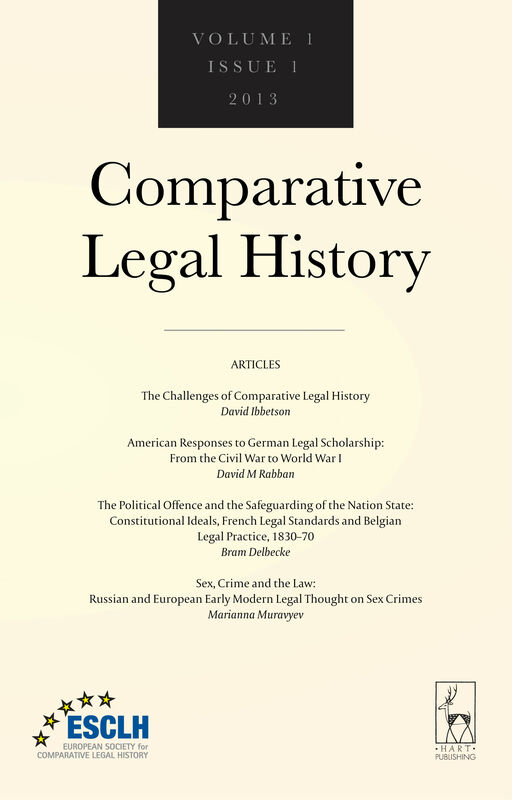 Hart Publishing is delighted to announce the publication of Comparative Legal History a new double blind peer reviewed journal. Comparative Legal History is an international and comparative review of law and history. Articles will explore both 'internal' legal history (doctrinal and disciplinary developments in the law) and 'external' legal history (legal ideas and institutions in wider contexts). Rooted in the complexity of the various Western legal traditions worldwide, the journal will also investigate other laws and customs from around the globe. Comparisons may be either temporal or geographical and both legal and other law-like normative traditions will be considered. Scholarship on comparative and trans-national historiography, including trans-disciplinary approaches, is particularly welcome. The Editors welcome scholarly submissions in the English language. · To propose a review, please contact Agustín Parise. Book reviews will generally range from 1500 to 2500 words. Review articles will also be considered. The journal is published, both online and in print, twice a year, appearing in the spring and the autumn. To read the abstracts, access this issue online and purchase individual papers please click here. Comparative and Economic Approaches to Law: A Tale of Wilful Misunderstanding?